Written with the help of tutors and students this practical guide is invaluable for everyone working with people with mental health problems, and is an aid to conducting efficient and comprehensive psychiatric assessments. 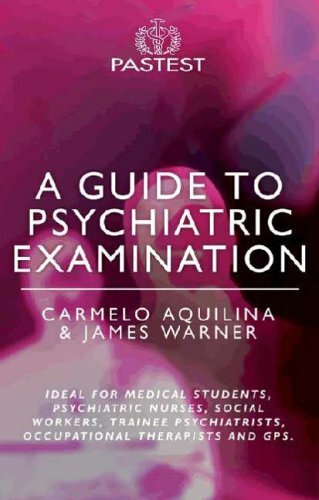 The book contains a detailed review of a general psychiatric assessment and has practical guides on assessments in eleven specific problems and four groups of people. An extrmely readable and comprehensive account of the process of taking a hisory from a patient with a psychiatric illness ... All students who read this book will come away aware that they have learned from modelling the masters.' Stephen Tyler, Clinical Lecturer in Psychiatry, University of Newcastle-upon-Tyne. 'An essential read, this book is simple to follow and engaging, but above all it got me throught my psychiatry attachment and gave me great confidence. --Helen Garthwaite, 5th year Medical Student, Imperial College London. Dr Carmelo Aquilina MD. FRCPsych, Consultant Old Age Psychiatrist and Clinical head of Old Age Psychiatry Services , Middlemore Hospital, Auckland, New Zealand. Graduated in Malta, trained in Liverpool and London and worked as a Consultant in Sheffield, Eastbourne and London, United Kingdom. James Warner MD MRCP MRCPsych Senior Lecturer in Old Age Psychiatry, Imperial College London. Honorary Consultant in Old Age Psychiatry, Central North West London Mental Health Trust.